You can check if the corn is done by pulling back the husk to check if any raw kernels remain. Cooked corn is moist and more vibrant in color. In the photo above, the ear at the top of the photo is uncooked. The deeper colored on at the bottom of the photo is cooked. If you find your corn isn’t completely cooked, put it back in the microwave for another 30 seconds or so. Be careful, as the corn will be very hot. I use tongs and/or a hot pad to remove the cooked corn from the microwave. Next, shuck it, continuing to use tongs, hot pad, or a dry towel to aid in the process. The silk will be very easy to remove once cooked. Overall, there is much less mess than when you’re husking it raw. This method is more efficient for a small numbers of ears. When you cook in a microwave, the time it takes is multiplied by the number of items you are cooking; thus 10 ears, enough for a large party, will take 20 minutes. I know that doesn’t sound like a tremendous amount of time, but I’ve often been surprised at how long it takes. 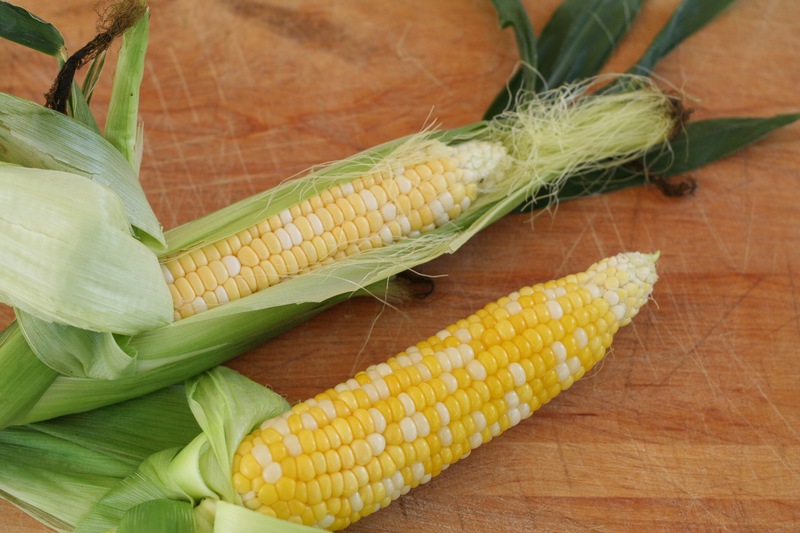 Corn on the cob is delicious right off the cob when in season, but in order to hold on to the taste of summer, I make sure to cook several ears and then cut off kernels to tuck them in the freezer for use over the winter. I particularly love adding some of my frozen corn to a mid-winter vegetable stir-fry. It adds an intriguing sweetness. Your own farm market frozen corn will be far superior to any frozen corn that you can purchase from your local grocer. Directions follow for cutting the corn off the cob, which you will want to do before you freeze it. Remove the cooked corn from the microwave. If you are going to cut the kernels off the cob for later use, good news: you can put the hot corn to the side and let it cool before you shuck it. Once cool, shuck the corn. 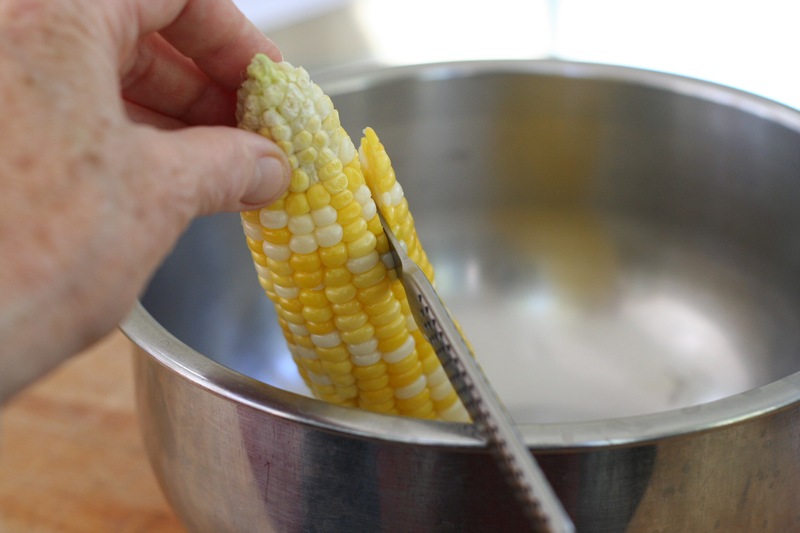 Use a sharp knife to strip rows of kernels from the cob, starting at the top. Place the cooked corn cob in a deep bowl. Some of the corn kernels always fly off the cob when you are cutting them off. Standing the ear in a deep bowl during this process will minimize the mess. 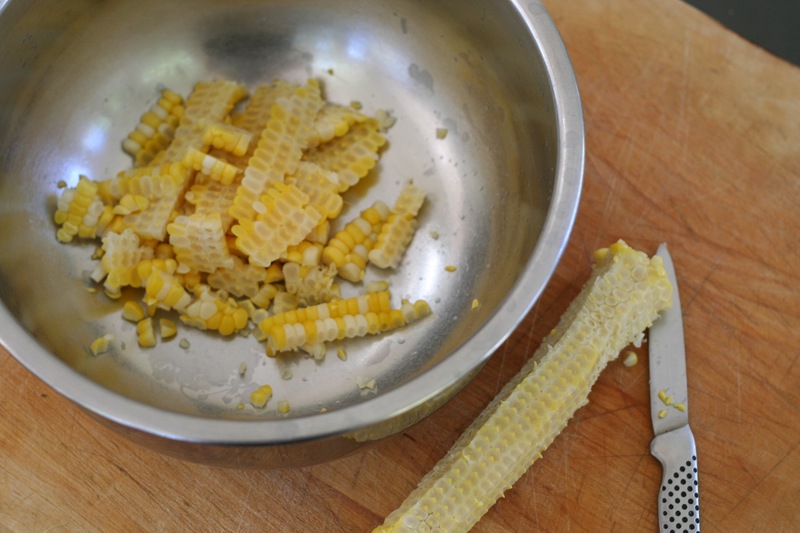 Using a sharp paring knife, strip rows of corn kernels from the cob. I like to start at the thinner, top end of the ear. I have more success removing the kernels this way. Your cutting motion will be in a more natural sweep, from in to out. If you start from the thicker base end it is harder to make a good, clean cut. After I cut the corn from the cob, I freeze it in small portions. You can expect to get approximately 3/4 cup corn kernels from one medium ear of corn weighing about 1/2 pound. The cooked corn kernels are also delicious added to salads, cornbread, soups, stews, and more. So get creative with your fresh, cooked, cut corn kernels! This entry was posted in Cooking Basics and tagged can freeze, cooking basics, corn, corn on the cob, how to, produce, summer. Bookmark the permalink.